Pull the red ripcord and the door should open very easily. If it doesn't, then the springs are not tensioned correctly. Moot point. I no longer have to deal with a double door. The single 10’ wide door is a breeze to open and close. I think double doors are ugly, anyway. What is the typical double garage door width on newer homes in different states? I have a 45 years old home in California, and it has a 16ft garage door. Maybe 45 years ago the cars were narrower. My car is about 6'8" wide, and want to park a second car in there. I could not. It would only allow (16'-2*6'8")/4=8" clearance for each rear view mirror. To avoid crashing my car every day, I would have to drive it in/out with a <4" precision, successfully repeated 365 times every year. That is impossible. Even if I could drive with a 4" precision, the garage is 19ft wide inside, I could not open the car door. I'm thinking on moving to another state, into a new or newer home. Do builders make more sensible 18ft garage openings these days, or I really have to drive with 4" accuracy? I don't know, but it cracks me up that to this day, builders are STILL putting up homes with a 1 car garage, as if any modern family only has one car anymore. To me, at least a full width 2 car is mandatory, especially where I live with all the hail risk. We were looking at building on a lot in the older part of town and with side yard setback requirements could only go to 40' wide. We chose to only have an 18' wide garage knowing that even with a 16' door it was impractical to fit 2 cars in it. It was deeper than normal so there was storage space behind the car but we only figured my wife's car would go in Mine would go outside. The project got scuttled for other reasons. In the south it isn't uncommon to have no garage at all. I am increasingly disappointed in builders of new homes who are putting in really small or short (low overhead clearance) garages. We have a very normal height (not lifted or extreme) Silverado truck that would not fit in the doorway of many garages we look at with clients. We've pointed it out many times to buyers. With the prevalence of 4x4 and SUV vehicles, I don't understand small garages on these new homes except that it's cheaper and they hope buyers won't notice until after they've closed. The shame is that it's REALLY hard, or rather impossible, to correct later. Personally, I’d haven’t seen any new homes with single car garages in more years than I can remember! I’m seeing two car garages with 16 foot garage doors because is considerby more money to provide the same house than with two garage doors. Way less than half the cost for the material and labor so the builders goal is to keep the house as inexpensive as possible to sell quickly especially for developement homes in the lower price bracket. Some builders put in multiple 1 car doors, instead of a big 2 car door, so the width is still relevant. My parents live in a house with a HUGE 3 car garage (over 1200 sqft) with 3 single doors. We have a regular two car and we can fit a minivan and a Mazda CX-9 (have only tried this a couple times because it's a Cirque du Soleil contortion to get out of vehicles....I usually go out the sliding door in the back seat of the van). But we easily fit one of those plus one of our sedans. Our garage is pretty deep....we have built in shelving in back of the garage, water heater, a freezer and the kids' bikes. To fit 2 cars in a garage with a 16ft wide door, you need a larger garage inside. 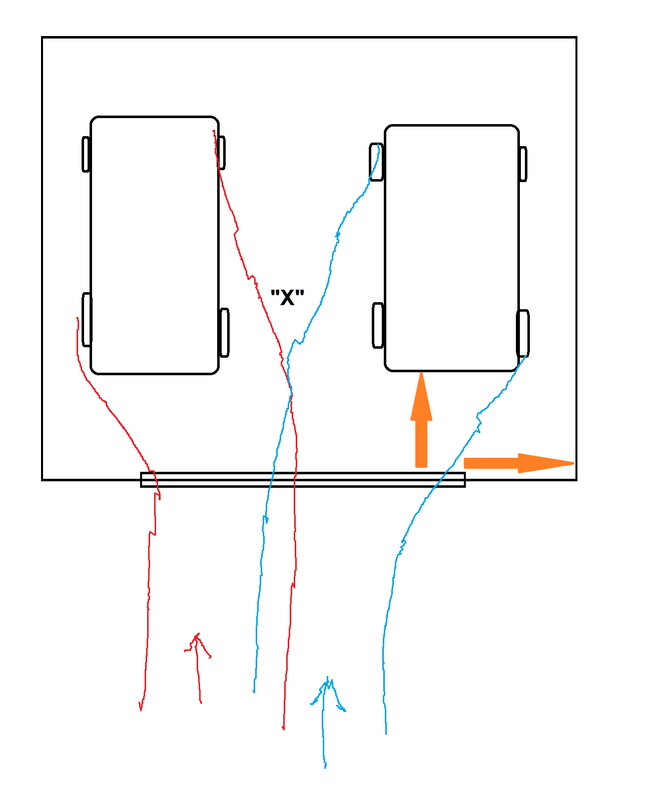 that is to pass the middle section of trhe garage door and separate inside from the other cars, you need to travel inward ans sideways. To me it seems you would need 3-4ft from the garage door to the back of the car when its in, and 3-4ft min sideways. It's much easier to angle in rather than maneuver in. There simply isn't enough room in most garages to anything else.